Author and Lecturer | Laurel Corona » Blog Archive » Happy Travelersary! This morning I got off the ship in Singapore on the first anniversary of My Year of Living Travelly. Now officially I have to make that plural, since I am booked pretty solid for the next twelve months. 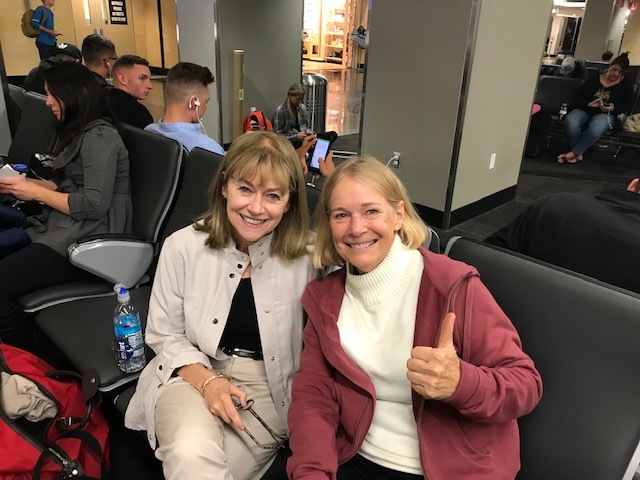 On March 16 2018, I set out from San Diego to the Amazon with my friend Jane Halsey to start my adventure. Here we are, ready to go! 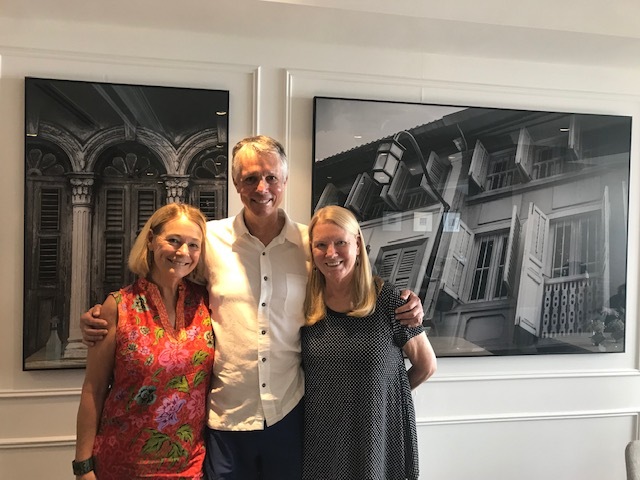 And here I am, exactly one year later, with friends, Dayle and Larry, who by coincidence are in Singapore waiting to get on the ship I left this morning. I met them on that first voyage, from Manaus, Brazil to Monte Carlo, so they are in a sense the bookends to the year. 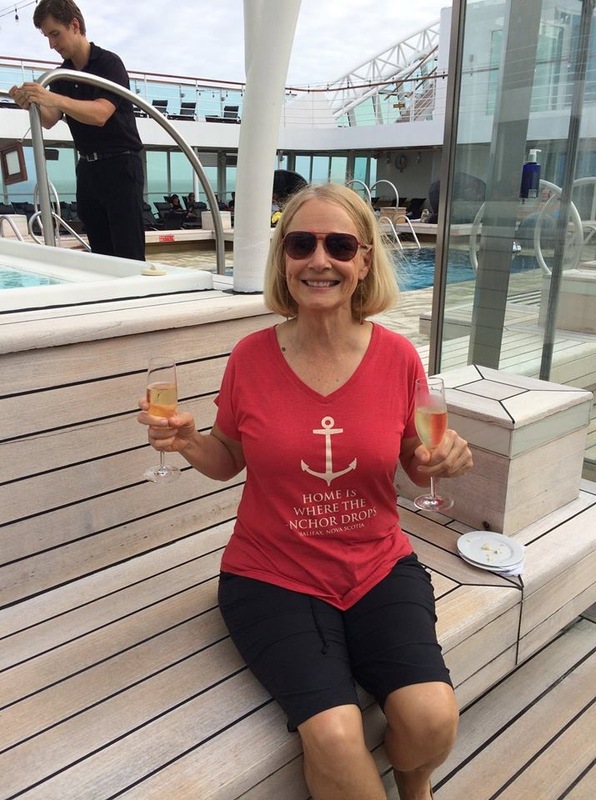 Looking back through the photos of this amazing year—visiting nearly 30 countries and every continent but Antarctica—I found this photo of me sporting my favorite slogan, “Home is Where the Anchor Drops. Note the two-fisted champagne. I was holding the photographer’s as well as my own, though some who have traveled with me may doubt that explanation, and with good cause. That tee shirt got me thinking, because I am not sure I agree anymore. Home is where my suitcases are. Even when I am back in San Diego, I live out of suitcases, because my condo is rented out. I really don’t have a home now. Home is my wallet. Money and credit cards make everything okay. Home is crawling into bed, wherever that might be. Right now it is a hotel bed in Singapore I am snuggled into as I write this. Home is seeing and touching my passport as I travel. Yes, I compulsively worry about that, and giving it a little pat is strong reassurance that I am okay. Home is wherever I put my toothbrush. Much of the time as I move around I can’t remember exactly what pocket of which bag it is in (example: right now), but it’s another thing it is very grounding to locate. Home is having local currency. Many places take dollars, but I still feel better knowing I have money for the taxi or the food hawker. Makes me feel at least marginally more local. Home is FaceTime with Dan. It is so nice to know he’s there, and that he’s got my back. Home is clothes that still fit. All’s right in the world when I can zip up my pants and button my shirt. Add to that, home is when the laundry is newly done, and I have a choice of anything I want to wear. Home is email and Facebook. Because home is friends, even many time zones away. Home is pulling out a room key that (miraculously) I have not managed to lose. Home is the absence of such annoyances. Home is taking my shoes off after a loooong tour day. Home is knowing I have a posse of friends on board. I know so many crew and usually find a few lovely passengers fairly quickly. On this last cruise, when my hard drive crashed, I knew there were so many people who would help in any way they could. Home is the latest hurdle surmounted, whatever it is. Home for me is not an address anymore. It isn’t a strucure with a roof and walls. Home is where I am. More than that, home is me being who I am. Home is saying “I got this”about whatever comes up. Home is simply feeling grounded and adequately in control. No anchor needs to drop. I carry all the home I need with me.